Fire cupping (also known as cupping therapy or cupping) is an ancient technique that has been used for thousands of years. Early medical records show the Egyptians using cupping in 1550BC, followed by the Chinese, then the ancient Greeks, which then spread through the Asian and European civilisations. Performing cupping over injured sites speeds up recovery. Blood, toxins or cell waste can stagnate in injured areas, muscles or joints and cause pain. Cupping the injured area draws out the stagnant blood, toxins and cell waste away from the injury so that free healthy circulation can be restored, to heal more rapidly for faster recovery and pain relief. Traditional Chinese medicine teaches us that your health and general well-being rely on your blood, energy and body fluids (including hormones and lymphatic fluid) being able to flow freely through your body. Stagnation of any of these causes pain. This may be caused by injury, stress, a lack of blood, energy, or an invasion of cold in the body and joints. When cupping is applied to specific acupoints on the body, it can improve circulation and bring warmth to affected areas, reducing pain and improving overall well-being. Today, many Olympians swear by cupping, they say it helps them because it saves them from a lot of pain. 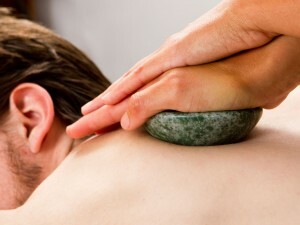 The technique uses the suction in the cups to pull the skin, muscles and tendons up and away from the body, rather than compressing them, as they are in a massage. This promotes blood flow, resulting in quicker healing. Athletes say it helps because when the cups are moved around it helps loosen tight muscles and tendons. Sportsmen and women have found that cupping provides relief from the soreness and pain they experience. They say that given the benefits, the cupping marks are a small trade-off for something that can ease the physical demands they put on their bodies. Fire cupping therapy involves the placement of heated glass cups on the skin which creates a vacuum. Your therapist creates this vacuum by removing the oxygen from the cup via a flame and the cup is immediately applied to the area that requires treatment. The skin and muscle layer is drawn into the cup and held. Cupping creates a unique pulling sensation that results in a tight feeling under the cups. Most people enjoy this intense feeling and the endorphin rush that comes with cupping. The application and removal of the cups alone generally lasts around 15 minutes (but can last anywhere from 5 to 40 minutes). At Zensations, we blend your fire cupping treatment with massage. Combining these two powerful therapies into one package creates the ultimate therapeutic experience. The marks left by cupping are a result of an increase in bloodflow to the area and from unwanted toxins being brought up to the skin surface and away from the injury, so that healthy free circulation can be restored. Cupping marks tell us the severity of the problem: moderate blockages will be pink or red and take a day or two to disappear, while severe stagnation will be deep scarlet or purple and will take around 7 – 21 days to disappear.